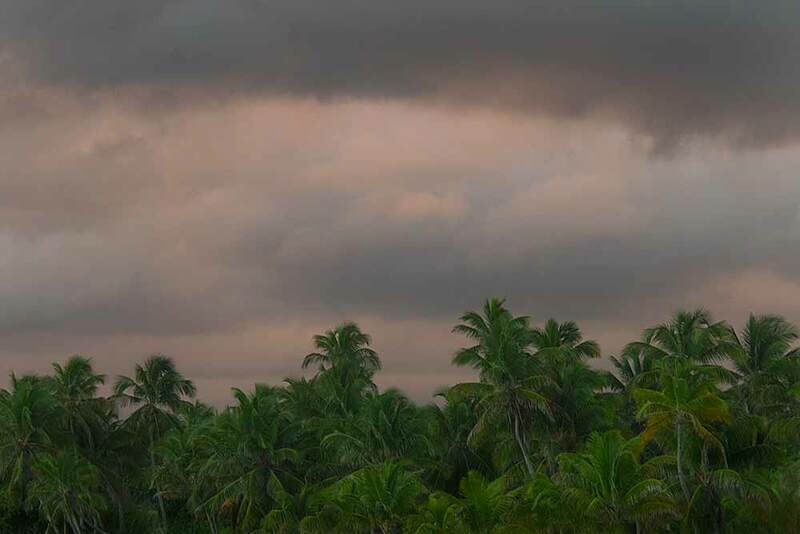 Belize NMS: Relatively moist and unstable conditions will prevail as a cold front approaches. 24-hour forecast: Cloudy at times today with a few showers and isolated thunderstorms especially over the sea and over southern coastal areas this morning then mainly north and inland this afternoon. Cloudy tonight with some showers, periods of rain and thunderstorms mostly north and along coastal areas. General Outlook: For Thursday and Thursday night is for cloudy windy and cool conditions with light rain mostly over the sea. Today NW 5-15 kts Light Chop 1-3 ft A FEW SHOWERS AND ISOLATED THUNDERSTORMS ESPECIALLY SOUTH. Tonight NW 15-25 kts Choppy-Moderate 3-6 ft SOME SHOWERS, PERIODS OF RAIN AND THUNDERSTORMS. Tomorrow N-NW 15-25 kts Rough 5-7 ft WINDY AND COOL WITH LIGHT RAIN. Outlook N-NW 15-25 kts Rough 5-7 ft CLOUDY AND COOL. A surface trough is over the Leeward and Virgin Islands from 22N63W to 16N67W. Scattered moderate convection from 15N-23N between 59W-63W. An upper-level low is centered over the Mona Passage near 18N68W. Upper level diffluence E of the center is enhancing convection over the Leeward Islands. This system continues to have a low chance of tropical cyclone formation during the next 48 hours. This system is expected to bring locally heavy rainfall to portions of the Leeward Islands, Virgin Islands, and Puerto Rico over the next couple of days as it moves generally westward to west-northwestward. In the southwest Caribbean, scattered moderate to strong convection is noted south of 12N between 76W-82W, due to the eastern extent of the Eastern Pacific monsoon trough. Scattered moderate to isolated strong convection is also inland over N Colombia, Panama, and Costa Rica. High pressure north of the area is supporting fresh trade winds over most of the Caribbean Sea. The trough across the Virgin Islands extending NE into the adjacent Atlantic will move across Puerto Rico through late tonight, and then across Hispaniola Wed. The tropical wave over the southeast Caribbean will move westward reaching Hispaniola and the ABC Islands by late Wednesday and early Thursday. Strong northerly winds and building seas will follow a cold front entering the Yucatan Channel late Wed. Expect enhanced shower and thunderstorm activity with periods of heavy rain for portions of the Yucatan Peninsula, Belize, Honduras and the adjacent waters of the northwest Caribbean through early Fri. Fresh northerly winds and seas to 8 ft will spread across the northwest Caribbean into Fri behind the front, then diminish Fri into Sat as the front stalls and weakens from eastern Cuba to eastern Honduras. 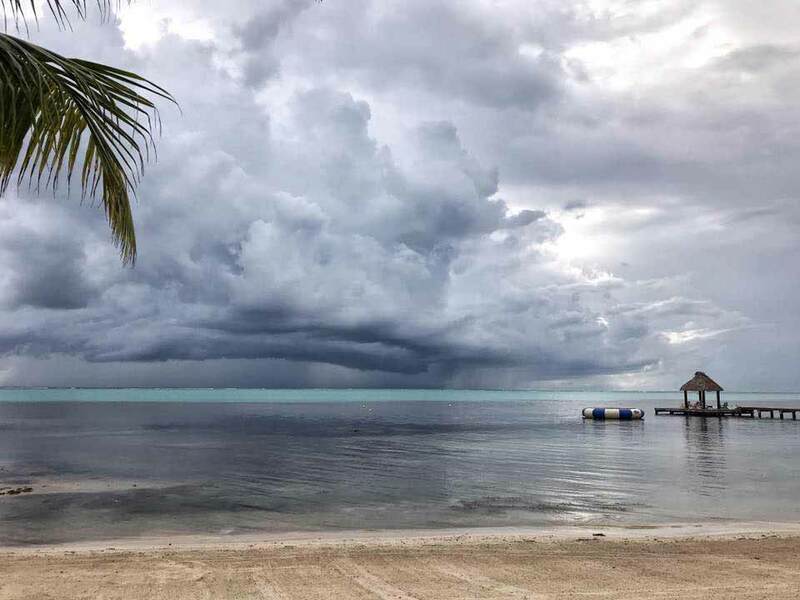 On Ambergris Caye this morning from the Northwest we have rain and dark clouds moving in. The sea around the barrier reef is calm. Today's expected high temperature is in the low 80's. Very different weather this morning, strong SW surface wind, light blue arrow, this is not "Tiger" wind. The whole of southern Mexico and Guatamala covered with cloud, pushing down from the north, yellow arrow, yet it is SW high cloud over the Yucatan, orange arrow and clear skies over the Caribbean. 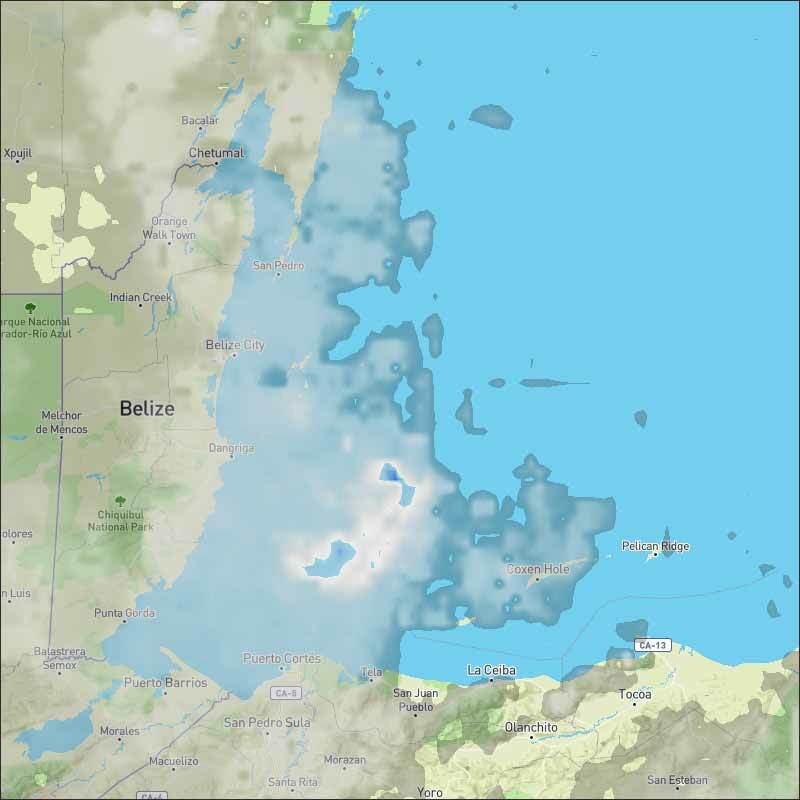 But those cloud and air masses are fighting each other over Belize. There has been a wide band of cloud over the southern and eastern USA for weeks, it appears that there is another cold front pushing down, so we had a warmer night than usual. There is a lot of rain around this morning, north Belize and coastal regions central and south, which may well come inland later today. This is not ITCZ activity, like down near Panama, red blob, but winter weather coming down from the north, causing air mass clashing, not swellups, so lightning less likely, although there is a swellup off PG, where there was one lightning strike, where the heaviest rain is at present. 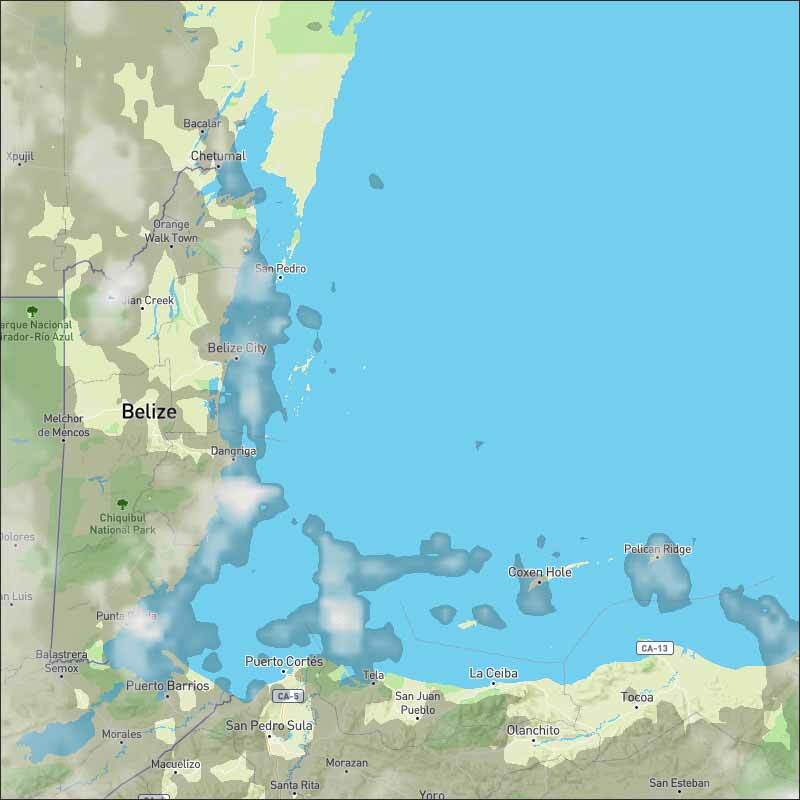 Looks like today will be mainly cloudy for most or all Belize today, with gusty winds and areas of significant rain from time to time. 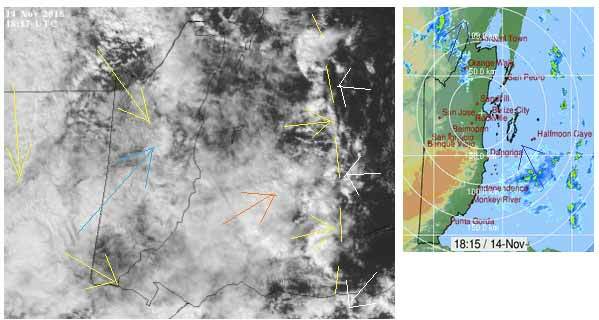 The surface SW winds are winning and pushing out into the Caribbean under the easterly Caribbean clouds, there are some sunshine holes or thinning cloud in some central or western areas, but significant rain in north Belize and some coastal areas, as the two air masses clash. Looks as if this unusually weather, is strongly pushing cloud down from the N to NW yellow arrows, has now pushed well out into the Caribbean sea. Resulting in strong surface winds, light blue arrow from the SW giving mainly overcast conditions, but with the odd gimps of sunshine, but still with some significant rain showers, mainly in the north. The easterly Caribbean winds, white arrows, have almost been stopped, and very little high level cloud, orange arrow.